The component builder has two tabs at the bottom - Settings and Xbasic. The Settings tab is the tab every developer uses to build components. The Xbasic tab is the Xbasic definition that Alpha Anywhere generates for the component. It contains all of the settings you would find in the e.tmpl object. You can find the Xbasic property on the Xbasic tab for the desired setting or control by searching the component definition. 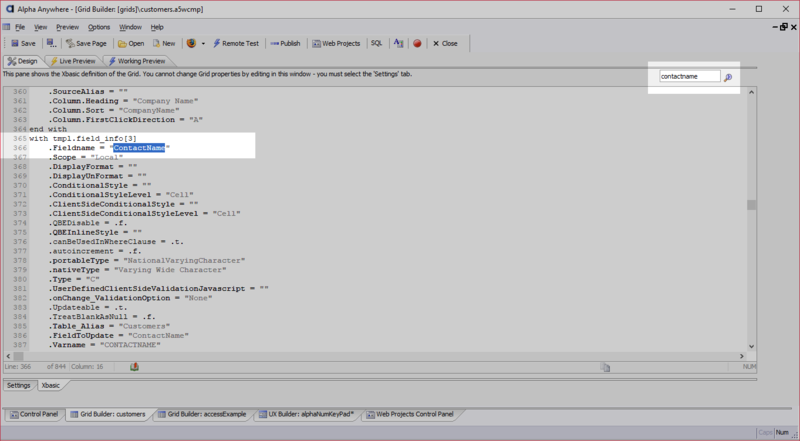 The search box is located above the code editor on the Xbasic tab. If you are searching for a control property, you can search for the control's ID -- e.g. "contactname" -- to locate the control's settings. Find properties faster in a UX Component by selecting the control with the settings you're interested in before opening the Xbasic tab. Alpha Anywhere will jump straight to the control's definition. When the debug(1) statement is reached while running in Live or Working preview, execution of the application will halt and the Xbasic Debugger will open. 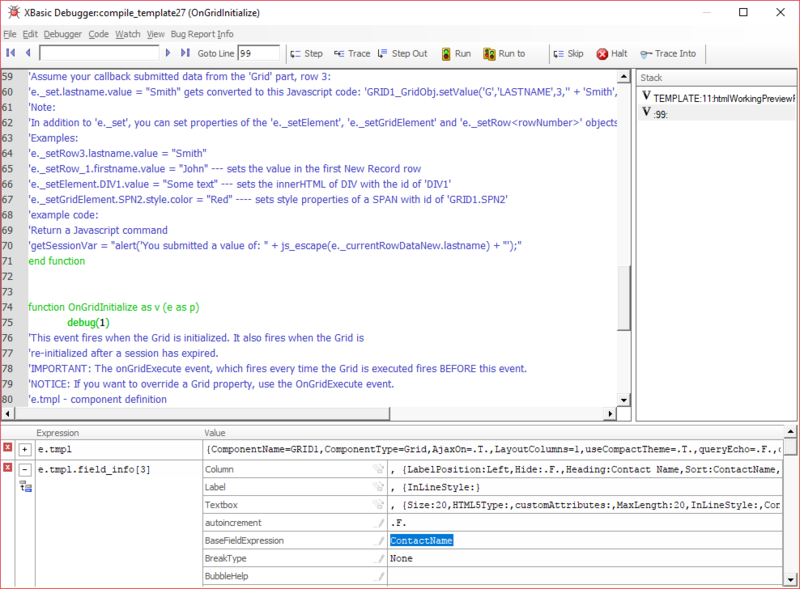 You can use the tools in the Xbasic Debugger to inspect the information that is in the e.tmpl variable. If a component contains no server-side expressions or security, the control definition will always be stored in the same variable. If a control is hidden, however, using Security rules or a server-side show/hide expression, the control settings are dynamically populated. dim exists as L = .f. exists = .t. ' the "state" field is in the component! The Grid component stores field definitions in the e.tmpl.field_info array. See Xbasic arrays to learn more about arrays.